Overview: Allium is a genus that contains hundreds of types of flowers. This genus contains many edible herbs like Allium sativum (Garlic). Garlic was primitively used by many civilizations. It was used by the Egyptians. It is believed that garlic has been used by the Indian sub continents since the beginning of civilization but there are no proofs about it. It was only during nineteenth century that it was ornamentally. There are many varieties and hues of Allium. These flowers are usually three feet high. Some flowers in this genus are pretty big. The flowers of Allium albopilosum are about eleven inches broad. Mt. Everest is the famous variety for cut flower. The flowers are usually purple in color. The big flower consists of small little flowers joined together to form a circle. They give off the smell of onion which can be wierd. They are grown during summer. They start blooming from spring. Myth: There are so many myths related to Allium Sativum, commonly known as garlic. An Islamic mythology says that there was a fight etween the godsand demons in heaven. The devils lost and they fled from heaven to hell in order to save their lives. When Satan ran away from thegolden gate of heaven, a flower grew on his toes. Another mythology talks about Homer. It is believed that Homer had a lot of faith in garlic and he told everyone that it was garlic that protected Ulysses from transforming into pigs Inaddition, there are many other crazy myths that people carried around about garlic. Some believed that it had the power of protecting people from evil and black witches. They hung garliics everywhere, from the top of the doors to beds in order to be safe from the evil. Outdoor plantation: Allium should be planted in an area where sunlight falls all the time, from sunrise to sunset. Allium however does not grow well in soggy areas. Thus, Allium should be planted in an area where the soil has a good drainanage system. If the drainage system (the capacity of water to escape through the soil) of your garden is not good enough then there are solutions for it. One can alter the level of soil drainage by adding organic mass in the soil.The organic mass must be added in such a way that the mass is about two or three metres thick in height. There are many examples of organic moss for instance, home made stuffs like the dried hay (peat moss) or even the recycling of all the natural products( compost manure). The Allium bulbs can be found in stores. One should be careful when buying them and not choose bulbs that are smelly, wet or have all unnatural tiny black spots in it. A hole of about two and a half to three inches should be dug in the soil and the bulb should be kept in it. Two consecutive Allium bulbs should be placed with a gap of seven inches.The bulb should be kept in the hole in such a way that the sharp, edgy area of the bulb turns upwards, looking at the sky. As soon as the bulb is planted, water should be added to the spot of plantation. Once the spring season hits your town, you will be able to see the plant starts springing up. Once the flowers begin to ripe, the garden will look more beautiful than ever. However, if you want to pluck the flowers from the plant in order to keep them in vases or other places, you may happilly do it for that does not the affect the health of the plant at all. When the flowers stop blooming, the leaves of the plant should be left alone. It should be allowed to grow and wither in its own natural pace.The leaves should not be plucked or removed from the foliage. After some times the leaves become dry and wither.The whole foliage becomes yellow. Only after than can the leaves be taken off the foliage. Indoor plantation: The Allium can bloom just as effectively inside a building as it does on the outdoor gardens. It is pretty easy to grow them indoor.One must have a vessel which can be litterally anything, homemade or bought on shop. However, it should consists of holes so that there is a circulation of air and water for the plant. Now once one has a vessel, it should be filled with soil that has a high drainage quality.One should not compromise with the drainage capacity of the soil or the Allium will not sprout at all. Once the soil is set up in the vessel, the Allium bulbs should be put in them. The bulb must be planted abot two and a half to three inches deep and every consecutive bulb in the pot should be planted with a gap of about siz and a half inches.The bulb should be kept in the pot in such a way that the sharp, edgy area of the bulb turns upwards towards the sky. As soon as the bulb is planted, water should be added to the spot of plantation. When the flowers stop blooming and it is end of the season the leaves of the plant should be left alone. It should be allowed to grow and wither in its own natural pace.The leaves should not be plucked or removed from the foliage. After some times the leaves become dry and wither.The whole foliage becomes yellow. Only after than can the leaves be taken off the foliage. Once the spring season hits your town, you will be able to see the plant starts springing up.If you want to pluck the flowers from the plant in order to keep them in vases or other places, you may happilly do it for that does not the affect the health of the plant at all. Vase plantation: These flowers can be plucked and planted in vases too.Infact, due to the unusual shape of the Allium flowers it is widely used celebrated as a cut flower. There are some measures to be taken to maximize the beauty and effectiveness of Allium. First of all, the flower should be plucked off at a particular time-when the the flower has only sprouted to the half of its capacity. Next, the flower should be cut using anything that is not blunt, maybe a blade. In addition, the water in the vase should be changed as frequently as possible, maybe twice a day. A deter chemical can be kept in the water so that bacteria doesnt invade the plant. 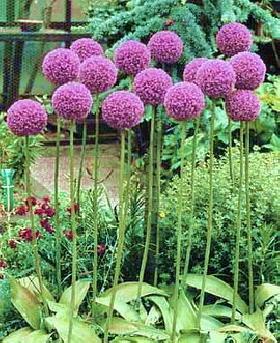 Uses: There are many varieties of Allium that are used in beds,borders and gardens.They are also grown indoor in pots. In addition, they are also used as cut flowers and exploited in the vases at home or office.They are used in bouquets too. Garlic is called Allium sativum. Surprisingly, Garlic also belongs to the Allium family. Garlic has been used by mankind since the very beginning of civilization. It has been used mainly as a spice. It is widely consumed throughout the world, especially in Indian continents. It had been known that garlic can decrease the cholesterol level. In addition, it is also believed that garlic helps in healing cancer. It also helps in slightly curing the disease "sugar" or diabetes. It can also help people with hypertension by decreasing the blood pressure of the patient in some way. However, strong medical researches have not been carried out on it.